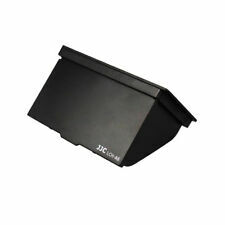 New LCDHD13 Sun Shade Protector designed for Panasonic AG-AC8. This screen sun cover prevents external light from entering the LCD screen, which allows you to see the LCD screen clearly without glare easily when you shoot outdoors. 1x LCD sunhood. This sunhood can fold flat for easy storage. 1 Screen Cover with Hood. 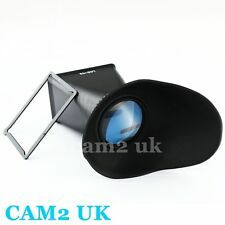 Can block unnecessary glaring light to help you to get a clear view, can also protect screen from scratches. The color of the sheet of sticker is random. Lightweight and portable, useful accessory for photography lovers. It is a perfect fit for RED 4.7" and 5" touchscreen monitors. LCD ViewFinder turns your video enabled HDSLR LCD screen into a huge electronic viewfinder for precise image evaluation - it's like viewing a 42" screen from 140cm (4.6 feet). New LCD Screen Viewfinder for Canon EOS M.
Hoodman H-200 LCD Hood for GoPro and all 2.0 inch Camcorder Screens. Sun Shade. 1 Screen Sun Shield. Suit for 3.5" LCD Screen. The outside is covered in a leather-like material and the inside has more of a felt/fabric type material. Battery plate: Sony F970. 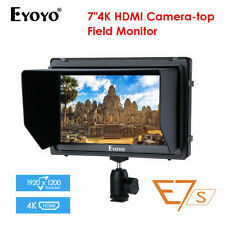 1X FS7 Monitor. 4K HDMI: 4096x2160 24p/ 3840x2160 (23/24/25/29/30p). 1X Hot Shoe Mount. 1X VESA Battery Plate (Battery NOT Included). Ear phone jack: 1. 1X HDMI A/C Cable. 1X Folding Sun Shade. 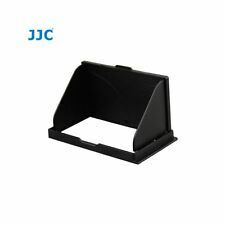 Pro Portable Waterproof Fast Release Hood For 5.6" HD LCD Monitor Panels Screen TVLogic 056 058 etc. The LCD hood side wings are guided by spring mounted hinges that open automatically when the top flap is opened. The display protection hardly takes up any room (ultra-slim design). Can be removed and reinstall, without leaving ugly residual on your LCD screen. ACMAXX HARD 2.8” LCD SCREEN ARMOR PROTECTOR FOR FujiFilm X10. What is ACMAXX LCD ARMOR?. ACMAXX LCD Armor is a hard Poly-carbonate screen protector with UV Low-Reflection Coating. This technology allows ACMAXX LCD Armor to effectively reduce reflection of sunlight and interior lighting to provide vivid pictures wherever you are. New LCD Monitor Cover Screen Protector for Nikon D300. 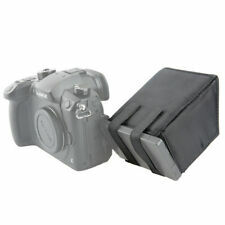 This LCD Cover is design for Nikon D300. FOR Canon PowerShot SX540 HS. ACMAXX HARD 3.0” LCD SCREEN ARMOR PROTECTOR. What is ACMAXX LCD ARMOR?. ACMAXX LCD Armor is a hard Poly-carbonate screen protector with UV Low-Reflection Coating. This technology allows ACMAXX LCD Armor to effectively reduce reflection of sunlight and interior lighting to provide vivid pictures wherever you are. FOR FujiFilm X100 / X100S. ACMAXX HARD 2.8” LCD SCREEN ARMOR PROTECTOR. Fujifilm X100 with ACMAXX LCD protector. What is ACMAXX LCD ARMOR?. ACMAXX LCD Armor is a hard Poly-carbonate screen protector with UV Low-Reflection Coating. ● Folds to envelope style for easy storage. Compatible With 3.5" DSLR/Camcoder. Model LHC-DV30. 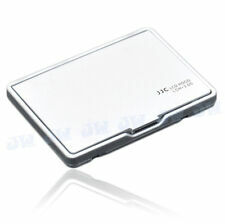 ACMAXX HARD 3.0” LCD SCREEN ARMOR PROTECTOR FOR DSC-H200. What is ACMAXX LCD ARMOR?. ACMAXX LCD Armor is a hard Poly-carbonate screen protector with UV Low-Reflection Coating. This technology allows ACMAXX LCD Armor to effectively reduce reflection of sunlight and interior lighting to provide vivid pictures wherever you are. ACMAXX 3.0” WIDE (3:2 ) HARD LCD SCREEN ARMOR PROTECTOR SCRATCH PROOF UV COATING. What is ACMAXX LCD ARMOR?. ACMAXX LCD Armor is a hard Poly-carbonate screen protector with UV Low-Reflection Coating. ACMAXX HARD 3.0” LCD SCREEN ARMOR PROTECTOR FOR SONY Cyber-shot DSC-HX9V. What is ACMAXX LCD ARMOR?. ACMAXX LCD Armor is a hard Poly-carbonate screen protector with UV Low-Reflection Coating. This technology allows ACMAXX LCD Armor to effectively reduce reflection of sunlight and interior lighting to provide vivid pictures wherever you are. ACMAXX HARD 3.0” LCD SCREEN ARMOR PROTECTOR. This sale for ACMAXX Lcd protector ONLY. What is ACMAXX LCD ARMOR?. ACMAXX LCD Armor is a hard Poly-carbonate screen protector with UV Low-Reflection Coating. 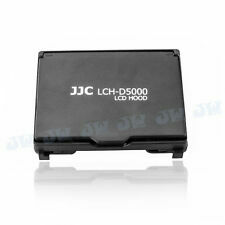 FOR Fujifilm FinePix S9800 / S9900W. ACMAXX HARD 3.0” LCD SCREEN ARMOR PROTECTOR. What is ACMAXX LCD ARMOR?. ACMAXX LCD Armor is a hard Poly-carbonate screen protector with UV Low-Reflection Coating. 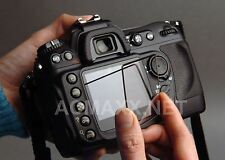 ACMAXX 2.5” HARD LCD SCREEN ARMOR PROTECTOR SCRATCH PROOF UV COATING FOR SONY A100 DSLR. ACMAXX protector do not have logo on the product and design looks much better. What is ACMAXX LCD ARMOR?. ACMAXX LCD Armor is a hard Poly-carbonate screen protector with UV Low-Reflection Coating. ACMAXX 3.0” HARD LCD SCREEN ARMOR PROTECTOR SCRATCH PROOF UV COATING FOR SONY A500 / A550 / A560 / A580 DSLR. What is ACMAXX LCD ARMOR?. ACMAXX LCD Armor is a hard Poly-carbonate screen protector with UV Low-Reflection Coating. FOR Fujifilm FinePix S9200. ACMAXX HARD 3.0” LCD SCREEN ARMOR PROTECTOR. What is ACMAXX LCD ARMOR?. ACMAXX LCD Armor is a hard Poly-carbonate screen protector with UV Low-Reflection Coating. This technology allows ACMAXX LCD Armor to effectively reduce reflection of sunlight and interior lighting to provide vivid pictures wherever you are. ACMAXX 3.0” HARD LCD SCREEN ARMOR PROTECTOR SCRATCH PROOF UV COATING FOR NIKON D5100 DSLR. What is ACMAXX LCD ARMOR?. ACMAXX LCD Armor is a hard Poly-carbonate screen protector with UV Low-Reflection Coating. Place the adhesive screen protector on the LCD screen and smooth it out with the included squeegee to not leave bubbles. Superior Screen Protection: Slide-on design allows you to easily remove & attach the shade to your screen without fear of damaging the screen. 1 X LCD Hood. Colour: Black. 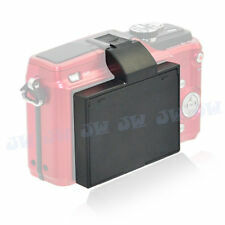 Compatible with: Sony NEX-3 and NEX-5. 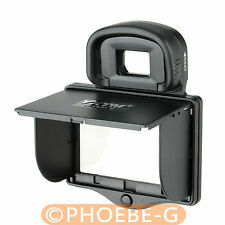 Blocks out light for better view of your LCD screen. ACMAXX 3.0" HARD LCD SCREEN ARMOR PROTECTOR Nikon Coolpix A900 A-900 camera 3"
ACMAXX 3.2” HARD LCD SCREEN ARMOR PROTECTOR SCRATCH PROOF UV COATING. ACMAXX protector do not have logo on the product and design looks much better. What is ACMAXX LCD ARMOR?. ACMAXX LCD Armor is a hard Poly-carbonate screen protector with UV Low-Reflection Coating. FOR NIKON D3500 DSLR. 1X ACMAXX LCD ARMOR MODEL – NLP-D3500-S1 FOR NIKON D3500. ACMAXX 3.0” HARD LCD SCREEN ARMOR PROTECTOR SCRATCH PROOF UV COATING. What is ACMAXX LCD ARMOR?. ACMAXX LCD Armor is a hard Poly-carbonate screen protector with UV Low-Reflection Coating. FOR Panasonic LUMIX FZ1000. ACMAXX 3.0” WIDE HARD LCD SCREEN ARMOR PROTECTOR SCRATCH PROOF UV COATING. What is ACMAXX LCD ARMOR?. ACMAXX LCD Armor is a hard Poly-carbonate screen protector with UV Low-Reflection Coating. ACMAXX HARD 3.2” LCD SCREEN ARMOR PROTECTOR. What is ACMAXX LCD ARMOR?. ACMAXX LCD Armor is a hard Poly-carbonate screen protector with UV Low-Reflection Coating. This technology allows ACMAXX LCD Armor to effectively reduce reflection of sunlight and interior lighting to provide vivid pictures wherever you are. FOR Sony Cyber-shot RX100-IV ( RX100 mark4 / RX100M4). Sony RX100M4 with ACMAXX LCD protector (NOT for RX100 fist version). for using on RX100M4 ( Mark 4 ) version ONLY! ACMAXX HARD 3.0” LCD SCREEN ARMOR PROTECTOR. ACMAXX 3.0” HARD LCD SCREEN ARMOR PROTECTOR SCRATCH PROOF UV COATING. This sale for ACMAXX Lcd protector ONLY. ACMAXX protector do not have logo on the product and design looks much better. What is ACMAXX LCD ARMOR?. 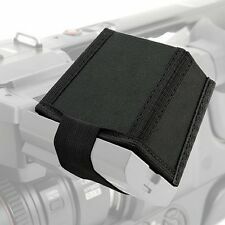 ACMAXX 2.7” HARD LCD SCREEN ARMOR PROTECTOR SCRATCH PROOF UV COATING FOR SONY A320/A330 /A380 DSLR. ACMAXX protector do not have logo on the product and design looks much better. What is ACMAXX LCD ARMOR?. 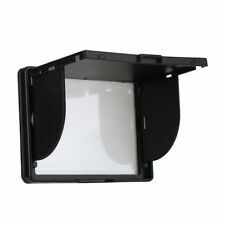 Lilliput Camera Monitor - Model 667 GL-70NP/H/Y/S 7 inch.